A flawless look has never been easier to achieve with our brushes and applicators. These are the finest tools available for professional or personal makeup application. 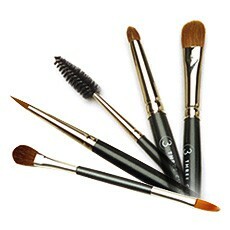 Sable/Pony - Ample bristles in a flat body for smooth powder application over the entire eye area. Sable/Pony - The ideal size for detail work in the eye area. Great for lid application and highlighting. Synthetic Taklon bristle - Once you use this brush, you'll wonder how you ever did without it! Synthetic Taklon bristle - The perfect shape for accurate application of color. Synthetic Taklon bristle - Slim and elegant and perfect for even the tiniest evening bag. Synthetic Taklon bristle - Replacement brush for our Lip Palettes. Synthetic Taklon bristle on one end and Sable/Pony blend on the other. Replacement for our Refillable Trio compact.